Clickworkers sort thousands of online store products into the correct product categories. An important success factor in online trade is the usability of the store. It is essential that the users get a quick overview of the range of items as well as access to the product they are looking for. This is possible when the product lines are clearly arranged and assigned to the appropriate categories and sub-categories. Structured data in the store facilitate internal search functions and optimize the store for search engines such as Google and co. Many store operators are faced with a huge task: They have a large range of products and want to optimize their store by editing category trees and providing more detailed information. Within a very short period of time, thousands of products must be examined with regard to their classification in the new category tree. These need, where necessary, to be corrected and expanded. In addition, new products that must be reassigned are continuously being added to the range. Numerous Clickworkers take a look at the pictures, names and descriptions of the products and classify them in the correct categories and sub-categories of the store. All of the classifications are carried out to the lowest level of categorization possible in the category tree provided by the customer. Each product is classified by two Clickworkers independently of one another. Concordant results produce a clearly correct classification. If there are differences, the respective product is classified by further Clickworkers to ensure a correct end result based on what the majority decides. To further optimize the store, the Clickworkers mark product photos which are of poor quality, which lack a product description or which display a description that does not match the product photo. i.e. classification of products based on product photos, product names, product brands, short descriptions, target groups and links to the appropriate product categories and sub-categories (up to four levels) of the store. Marking products that do not fit into the range of products sold by the store, that do not have product descriptions or are unsuitable, as well as marking poor quality pictures of products. The customer defines the job as well as the scope of the project and provides access to the product photos, links and information as well as the category tree via an API interface. 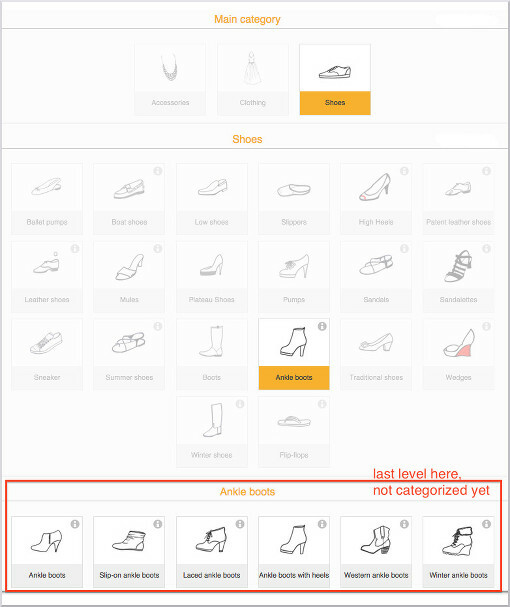 1 – 4 product images, a short description and a link to the product as well as the category tree of the store are displayed to every Clickworker. The Clickworkers classify the products in the appropriate categories and sub-categories by clicking on the respective field of the category tree. Poor quality product photos or inappropriate product descriptions are marked. Each task is handled by two Clickworkers simultaneously. The data are proper if the results match. The correct data are sent to the customer via API.